The year is 650 AD. The small Norse town of Mannarsfell is the scene of a brutal Ysian raid. It is autumn and heavy rain pours down from the skies. The field of battle is transformed in a thick muddy field. 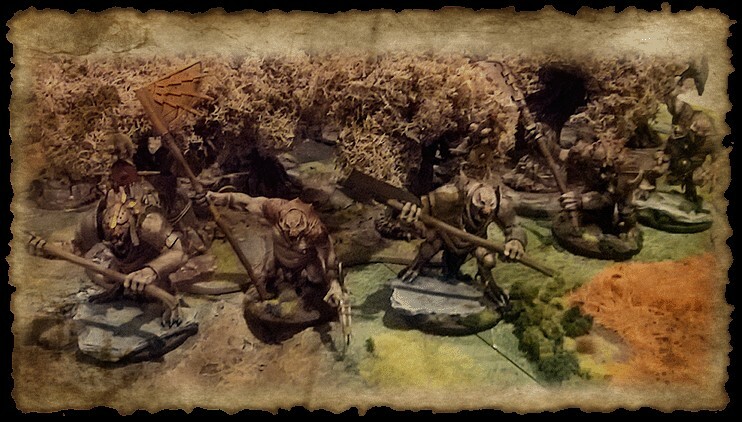 Jarl Skäldi leads his warband of troll warriors through the woods, intend on defending the village from the foul Ysian raiders. The Ysian raiders set up near the south of the village. A unit of brutes will be spearheading the assault. This bunch of frenzied maniacs is lead by a feared Deathbrute. The second wave of attack consists of an immens flesh-hulk named Druc. The last wave of attackers are a unit of axe-drunes, lead by War-drune Kai and Battle-drune Vance. The Ysians gain the initiative and the frenzied brutes race forward. Jarl Skäldi sends his first unit of trolls forward to meet them. A bloody combat ensues and the trolls manage to cut one of the brutes down. But the two surviving brutes hit back and one troll has only a couple of wounds left. War-drune Kai keeps the pressure on and sends Druc into the thick of battle. The enraged monstrosity charges into the trolls and totally obliterates the entire units with his big meaty fists! The horrified Holumann unit watches how the trolls are being eaten by Druc. Druc gains an impressive 18 blood tokens for his achievements! But the carnage is far from over. Frenzied Druc makes a breakthrough move and slams into the Holumann unit. The Norse humans remain disciplined and advance through the thick mud towards Druc. They start hacking away at the flesh-hulk but only manage to do a couple of wounds. The still frenzied Ysian warbeast immediately retaliates and eats 8 humans. The two surviving Holumann decide that enough is enough and flee. Rain is still pouring over the battlefield. Troll Gothi Laugär decides to take matters into his own hands and calls upon his sorcerous powers. He sends a series of crackling lightning bolts at the two remaining brutes and totally obliterates them. Another lightning bolt is send at Druc and manages to take away half of his wounds! Jarl Skäldi is emboldened by this show of force from the Gothi and charges the wounded beast. His bodyguard of elite troll warriors also enters the fray. The brutal shock attack is too much for the wounded Druc and he is killed by the troll’s great cleavers. The Ysian deathbrute commander joins the melee and challenges the troll Jarl for a duel. A short exchange of blows ensues and Jarl Skäldi cuts the deathbrute in half! War-Drune Kai tries to gain back the initiative and personally leads his axe-drunes into the exulted trolls. The War-drune swift charges into Skäldi and decapitates the troll with his great weapon. All remaining units in the Norse host take their woe tests and remain firm. Gothi Laugär takes over command and orders the great cleaver trolls to hack away at the remaining Ysians. War-drune Kai and his personal guard of axe-drunes are chopped into tiny bits. The Ysian invaders are repelled, victory to the Norse! Aftertoughts: Wow, what a great battle! Darklands has become my favorite wargame and this battle shows why. Brutal combat, epic duels, terrifying beasts, deadly magic, .. this game had it all. Playing my gaming buddy Krikke is always great fun. His Ysians are painted to a very high standard and I like their savage battle tactics. Frenzied units are very good because they double their blood and they are always on alert. But their downside is that they are very hard to control. So I had to lure them away from the main action. Sadly, because of the thick mud (slow going) it was impossible to lure them away with the holumann units. The puny humans were stuck in the mud and the brutes raced towards my lines. Krikke played his Ysians very aggresively and the outcome of battle was uncertain untill the end. The game went smoothly and we only had to interrupt the game a handfull of times because of rules issues. The Darklands rulebook looks quite intimidating, but the basic priciples are quite easy to learn. We are now in the process of learning all the master rules, they add a lot of dept to your game. I must say that I am very impressed by this ruleset and look forward to my next battle!